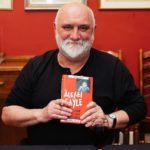 Alexei Sayle is an English stand-up comedian, actor, author and former recording artist, and was a central figure in the alternative comedy movement in the 1980’s. He was voted the 18th greatest stand-up comic on Channel 4’s 100 Greatest Stand-ups in 2007. In the updated 2010 poll he came 72nd. Much of Sayle’s humour is in the tradition of Spike Milligan and Monty Python, with riffs based on absurd and surreal premises. His act is noted for its cynicism and political awareness, as well as physical comedy. "I liked 35 and in both my novels that is the age of the lead characters. I tried making them my age but they just seemed to keep moaning about stuff." "If I won the lottery I’d start a charity that helped little family hardware stores, cobblers and fruit shops open in city centres." "I’ve accentuated the look over the years. As a comic, you try something and if it works you go with it and grind it to death." "As a comic, you try something and if it works you go with it and grind it to death." "If you travel to the States… they have a lot of different words than like what we use. For instance: they say ‘elevator’, we say ‘lift’; they say ‘drapes’, we say ‘curtains’; they say ‘president’, we say ‘seriously deranged git.’"
"People are more violently opposed to fur than leather because it’s safer to harass rich women than motorcycle gangs."